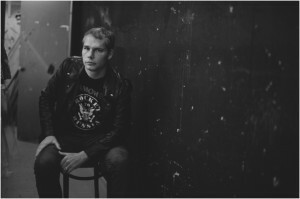 Shepard Fairey is a 1988 Idyllwild Arts grad. Photo courtesy Sidney Morgan. 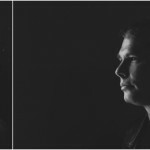 For the first time in 24 years, (Frank) Shepard Fairey, a now famous graphic designer / street artist, returned to his old high school, Idyllwild Arts Academy. Students, faculty and Idyllwild town folks packed the IAF Theatre and mobbed him for photos at the art show afterwards. It was his “Welcome Back, Kotter” moment. “This is the best thing that’s happened to visual artists,” said Kevin, a senior visual artist from Korea, as he stood in front of Shepard Fairey’s posters at the show. 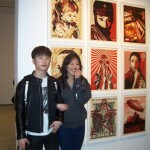 His friend took his picture with Shepard Fairey, which likely was later posted on Facebook. Back in 1987, when Shepard Fairey attended his senior year at Idyllwild Arts Academy, he was “stagnating” (according to his parents) with interests only in punk rock and skateboarding. When he got kicked out of North Carolina School of the Arts during the summer, he came to Idyllwild Arts. Ellenie, his former 2D design teacher, said that Shepard was an average art student. That year, he studied black-and-white photography, but then used color photography to make fake California Driver’s Licenses with his friends. Later, he used that same fake ID to get into LA clubs to post his “Obey” posters. 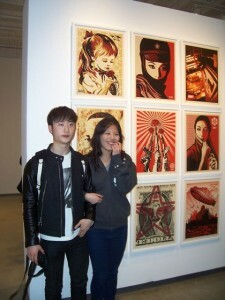 "He's the best thing that's happened for visual artists," exclaimed Kevin, with Cynthia, before Shepard Fairey's posters. Shepard also told how he jammed the color printer at Kinko’s with a paperclip and printed off hundreds 11 x 17-inch posters in black and red, but only paid for six copies. He’s not saying that it was right, but it’s what he had to do to as a struggling arts student to get his message (of questioning authority) out to the masses. A the Rhode Island School of Design, he remained active in the skateboard /punk rock culture. 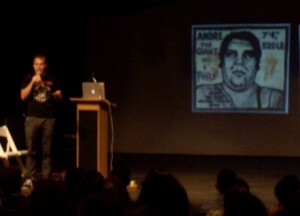 One day, he was showing a friend how to make stencils, using a newspaper photo of Andre the Giant. His friend refused thinking it ridiculous, but Shepard’s interest in the wrestler took off. And so did the popularity of his art. He stylized the image, and put it on buildings and walls around Providence. It made the local news. “I realized that the only things occupying the public space were government signs and advertising,” he said. 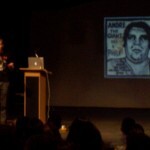 It all started with a crude sticker of Andre the Giant, Shepard Fairey said. He filled that public space with his “Obey” campaign. “But then I realized that scale was important,” Shepard told the crowd. (After all, Andre was over 7 feet tall and weighed 525 pounds). The next day, Andre the Giant’s face covered the politician’s, who also had mob connections. The billboard ‘makeover’ made the news again, but Shepard had to apologize. “It took him about four minutes to figure out who did it,” Shepard said, shaking his head. That incident didn’t stop Shepard from promoting his “Obey” campaign all over U.S. cities and towns, and getting arrested 16 times along the way. This wasn’t your average street artist “tagging” for his own fame, but a serious conscious objector using his art to bring issues to light. Shepard Fairey with iconic Obama poster and student. Some of them he showed during his slide presentation, including anti-war images featuring then-president George Bush with a Hitler moustache, and a young girl carrying a grenade in her hand. Other issues included the oppression of the Tibetan monks, air pollution, and water pollution. Yet, his anti-war slogans were most prominent. “We spend a lot of money on the military in the U.S., rather than education,” Shepard claimed. After showing the last slide of a giant tyrant boot ready to crush masses of people, he softened a bit. He spoke not just to the visual artists, but to young musicians and writers as well. He’s doing what we’ve always told our students to do, said Ellenie. Take something that you believe in and show it through your art. Although Shepard became most famous for his 2008 Barak Obama poster, Shepard didn’t spend much time on it. He said he was impressed with then-candidate Obama’s speech at the Democratic National Convention and decided to create a poster. He was lucky that it was sanctioned by the Obama campaign by a former skateboard friend. “That poster rose to the national spotlight like none other,” he said. 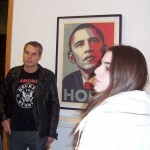 On campus, Shepard Fairey was approachable and congenial. He allowed Sidney M. to take these pictures. Since then, Shepard has become disappointed with some of President Obama’s politics, but said that he’s the best candidate around. Shepard’s work has appeared in galleries and museums around the country. He illustrated Time magazine numerous times. Even with all of his success, Shepard was “at home” among the artists at Idyllwild Arts. He allowed Sidney, a photography major, five minutes before his lecture to take several portraits of him. 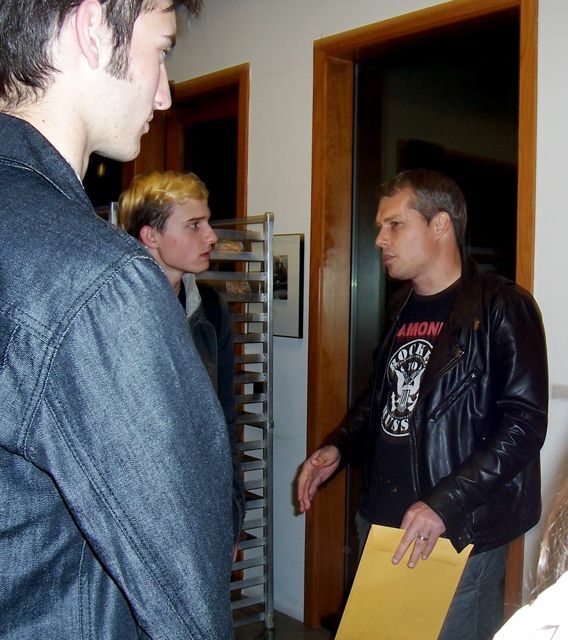 (from L) Eric, a film student, with Shepard Fairey. Eric offered to be an extra camera man sometime. View the pictures that Sidney took on her blog, www.sidneymorganblog.com. Eric, from Mexico, spoke to him about filming him in the future. “I’ve been saving up for my own video camera, and told him that if he needed an extra guy to shoot, I could do it,” Eric said. Shepard gave Eric his contact information, and since he was hanging around, he was interviewed by Gail Wesson for her Feb. 11 Press-Enterprise article. 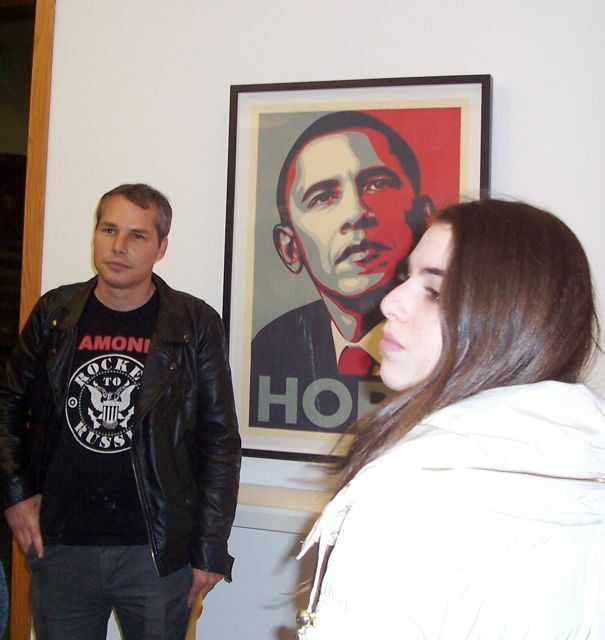 Shepard Fairey’s posters, including the 2008 Obama poster, remains on display at the Parks Exhibition Center on the Idyllwild Arts campus. Call (951) 659-2171, ext. 2251. To hear his one-hour lecture in its entirety, visit www.idyllwildarts.org, and click on UStream, or visit the latest issue of the Idyllwild Herald at www.idyllwildherald.com. 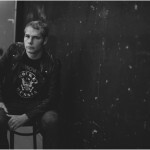 For Shepard Fairey’s art, visit www.obeygiantart.com. Shepard Fairey, an 1988 Idyllwild Arts grad. Photo courtesy Sidney Morgan. This entry was posted on Thursday, February 16th, 2012 at 12:39 pm and is filed under Art, Idyllwild Arts Academy. You can follow any responses to this entry through the RSS 2.0 feed. Both comments and pings are currently closed.